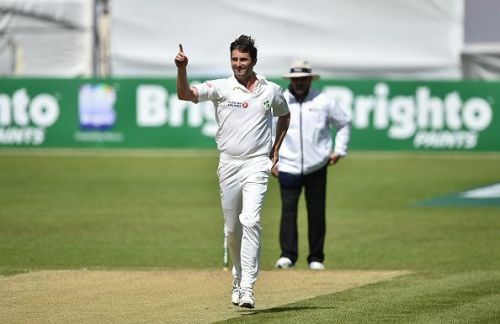 During the third day of the first Test match between Afghanistan and Ireland, Ireland's no. 11 batsman Tim Murtagh created a unique history. He became the first no. 11 batsman in the history of Test cricket to score more than 25 runs in both innings of a Test match. In the first innings after a top-order collapse, Murtagh’s 75 ball-54 was the top contribution which helped Ireland post a decent total of 172. He hit four 4s and two 6s for his maiden half-century. Along with George Dockrell (39), he was able to add 87 runs for the last wicket. Afghanistan were able to take a first-innings lead of 142 runs with brilliant half-centuries from Rahmat Shah (98), Hasmatullah Shahidi (61) and Asghar Afghan (67). In the second innings, Ireland posted 288 runs with the help of half-centuries from Andrew Balbirine (82), Kevin O Brien (56) and another last-minute cameo from Murtagh (27 off 32 balls). Even though he played with an injured finger, Rashid Khan was the pick amongst the bowlers for Afghanistan. The spin sensation scalped 5 wickets for 82 runs. Chasing a target of 147, Rahmat Shah (76) and Ihsanullah Janat (65*) made sure that Afghanistan crossed the line comfortably. They chased down 147 in 48 overs, losing just 3 wickets in the process. If not for the last-minute madness from the Afghan batsmen, they could have completed the win with 9 wickets to spare. While New Zealand took 45 Tests and India took 25 Tests to register their first Test win, Afghanistan were able to register their first Test victory in the second Test match they played in itself. Rahmat Shah was awarded the Man of the Match title for his twin half-centuries. With a commendable degree of maturity and a proper mix of controlled aggression and defence, Afghanistan have proved once again that they are going to be one of the greater sides in international cricket.